Nestled on the north bank of the Ohio River, Cincinnati is a stone’s throw from the bluegrass of Kentucky and Indiana’s horizon of corn and soybean. This month, the city served as the perfect backdrop for representatives from all three states to sign a historic agreement that will set the tone for the future of water quality across the region. 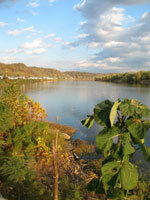 The groundbreaking agreement launches interstate water quality pilot trades in the Ohio River Basin, a program aimed to reduce the release of excess nutrients running off of farm fields into the network of waterways leading into the Ohio River, the largest tributary of the Mississippi River. The project, led by Electric Power Research Institute with assistance from American Farmland Trust, the Ohio Farm Bureau Federation, the Ohio River Valley Sanitation Commission, Hunton & Williams LLP, Kieser & Associates, LLC, and the University of California at Santa Barbara, marks the first time three states have come together to develop or implement an interstate trading program where all states operate under the same rules and a water quality credit generated in one state can be applied in another. What is Water Quality Trading? A cost-effective alternative for regulated utilities, wastewater treatment plants and industries to meet environmental regulations by buying nutrient reduction credits from farmers. A field tour of conservation practices on Schroer Farm in Patriot, Ind., showed possible credit-generation practices in action. American Farmland Trust’s role in the project is to ensure that the water quality trading program is developed in a way that allows for full participation of farmers. Not only will these practices improve the health of the entire river basin, but they will help keep farmers on the land and actively farming by adding a new source of income to their operations – the sale of nutrient reduction credit to utility companies, wastewater treatment plants and other regulated point sources. Representatives from Kentucky, Indiana and Ohio sign the Ohio River Basin Water Quality Trading Plan credit generated in one state can be applied in another. After three years of hard work, we’re just getting started. We plan to have the first pilot trades in place before the end of 2012 with the remainder implemented in 2013-2014. The water quality pilot trades will take place in up to 16 counties in Ohio, Kentucky and Indiana, and are expected to engage at least three power plants and up to 30 farms implementing conservation practices on up to 20,000 acres. Reduction of nutrients running from farm fields into waterways is expected to total approximately 45,000 pounds of nitrogen and 15,000 pounds of phosphorus annually. At full-scale, the project could include up to eight states in the Ohio River Basin and would potentially create credit markets for 46 power plants, thousands of wastewater facilities and other industries, and approximately 230,000 farmers. There is much work left ahead in order to get there, but with the signatures transcribed on a balmy August day in Cincinnati, we have taken a critical giant leap in the right direction. 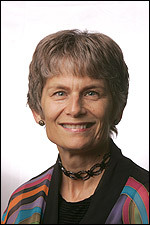 About the Author: Ann Sorensen, Ph.D. is Director of Research at American Farmland Trust. 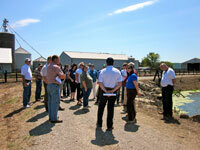 She currently sits on the EPA’s Farm, Ranch and Rural Communities Federal Advisory Committee. This entry was posted in Conservation, Indiana, Ohio, Water Quality and tagged conservation, environment, indiana, kentucky, Ohio, ohio river basin, Water Quality on August 16, 2012 by Ann Sorensen.